Jones, Keith. "Prince Hamlet's Haiku." I recently entered a Haiku Competition. I see you trying to scan that sentence. It doesn't amount to a haiku. Sorry. I exhausted all my poetic efforts on the actual haiku I wrote for the competition. Anyway, here's the haiku in question. It sums up the majesty, the beauty, the complexity of Hamlet in seventeen syllables. If I become inspired, more of these may follow. 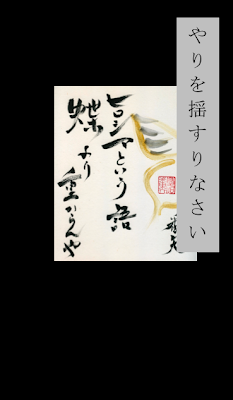 If not, just know that the Japanese characters inset into the image above are (according to Babel Fish, at least) "Shake Speare" in Japanese. P.P.S. The haiku won second place in the competition!